Overstock.com (NASDAQ: OSTK) CEO Patrick Byrne likes to call himself a “humble servant” to his company's shareholders and a “market reform advocate” to the investing public, while he and his company have a documented long history of false and misleading disclosures and utterly despicable behavior such as stalking and smearing critics with its in-house black ops team. As previously detailed in this blog, from December 2000 to March 2002, Patrick Byrne had lied about Overstock.com being profitable when the company was never profitable at that time. Overstock.com’s unprincipled management team intentionally violated GAAP in reporting revenues from at least fiscal year 2000 until the SEC Division of Corporation Finance recently forced the company to report revenues in compliance with GAAP. To make matters worse, the company misled the SEC Division of Corporation Finance about the materiality of its revenue accounting errors and therefore violated Statement of Accounting Standards No. 154 by not restating prior period financial statements to correct its revenue accounting errors. In fact, Overstock.com has had only two profitable quarters (Q4 2002 and Q4 2004) in its entire history. At least one of those quarters earnings were materially overstated as a result of Overstock.com's intentional revenue accounting errors that were uncovered by the SEC. To make matters even far worse, as detailed many times in this blog dating back to November 2007, when it comes to non-GAAP disclosures, Overstock.com has continually violated SEC Regulation G and overstated EBITDA in its financial reports filed with the SEC from Q2 2007 forward. Apparently, Patrick Byrne and his management team feel that they can make their own accounting and SEC disclosure rules on the fly - GAAP and SEC disclosure requirements be damned. In the mean time, the SEC sits by idly while Overstock.com distorts its financial performance to investors. It is incomprehensible that the SEC has so far failed to take any action against Overstock.com for violations of Regulation G, despite being continually informed by this blogger, its recently terminated investigation of the company, and also taking actions against other similarly non-compliant companies to force them to correct such violations. In Overstock.com’s latest Q2 2008 earnings report, the company improperly reported EBITDA of $1.117 million in violation of SEC Regulation G. Overstock.com’s reported non-compliant EBITDA was overstated by $1.545 million as a result of the company improperly removing from its EBITDA calculations the effects of certain stock-based compensation expenses and improperly reconciling EBITDA to operating loss rather than net loss, in violation of SEC Regulation G. Therefore, had Overstock.com properly reported EBITDA in compliance with SEC Regulation G, the company would have reported a negative EBITDA of $428,000 instead of its non-compliant positive EBITDA of $1.117 million. Patrick Byrne: Great. Slide number 10. EBITDA and this excludes stock based compensation. Do you want to mention that Dave? Do you want to – ? David Chidester: Just – there is different ways people calculate EBITDA I think. We just want to make sure it’s clear that our calculation of EBITDA does [ph] include stock based compensation. Patrick Byrne: Is that the convention? David Chidester: (inaudible) It’s completely the convention in our industry and I think because it’s a new – it only came about a couple of years ago, everybody pretty much excludes it when they talk about EBITDA and talk about cash earnings. What David Chidester said is that he thinks Overstock.com can compute EBITDA by eliminating stock-based compensation expenses from its computation and as a result of such a false claim by him, the company reported a materially overstated EBITDA in violation of SEC Regulation G. He further claims that removing stock-based compensation from EBITDA is "completely the convention in our industry." 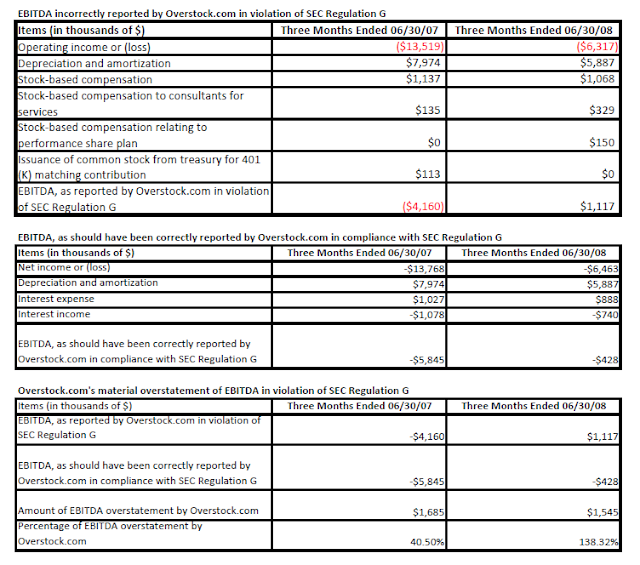 David Chidester's claims about Overstock.com's EBITDA disclosures are flat out false and as the CFO of a public company, he cannot claim ignorance to SEC Regulation G. That "everyone else is doing it" excuse was previously used by both David Chidester and Patrick Byrne as justification for the company's intentional revenue accounting errors uncovered by the SEC. However, SEC Staff Accounting Bulletin No. 99 specifically states that "Authoritative literature takes precedence over industry practice...."
In this case, Overstock.com improperly removed stock-based compensation expenses to flip a properly calculated negative EBITDA in compliance with Regulation G into an improperly reported positive EBITDA. In fact, for public companies the SEC provides specific rules for calculating EBITDA under SEC Regulation G. Overstock.com clearly cannot exclude stock-based compensation expenses from EBITDA. Question 14: Section I of the adopting release describes EBIT as "earnings before interest and taxes" and EBITDA as "earnings before interest, taxes, depreciation and amortization." What GAAP measure is intended by the term "earnings"? May measures other than those intended by the description in the release be characterized as "EBIT" or "EBITDA"? Does the exception for EBIT and EBITDA from the prohibition in Item 10(e) (1) (ii) (A) of Regulation S-K apply to these other measures? Therefore, the intended meaning of “earnings” for EBITDA under Regulation G is “net income as presented in the statement of operations under GAAP.” EBITDA can only be computed as earnings (meaning net income or loss) before interest, taxes, depreciation, and amortization and the SEC requires that “measures that are calculated differently than those described as…EBITDA in the adopting release [Regulation G] should not be characterized as EBITDA.” Net income, not operating income as used by Overstock.com, is the starting point towards computing EBITDA and stock-based compensation expenses cannot be excluded from EBITDA according to SEC Regulation G.
David Chidester’s above comments about Overstock.com's EBITDA disclosures are flat out false! On May 13, David K. Chidester, Senior Vice President – Finance sold 2,766 shares at an average price of about $27.83 per share of and pocketed gross proceeds totaling about $77,000. After Overstock.com’s Q1 2008 earnings call, the company’s stock price plunged 41.12% or $11.31 to close at just $16.31 per share. As David Chidester cashes out, Overstock.com shareholders are bearing the losses. As detailed above, Overstock.com, just like CGG Veritas, improperly removed the effects of stock-based compensation expenses from its non-compliant EBITDA disclosures in violation of Regulation G. Yet the SEC has continued to fail to take action against Overstock.com to correct such non-compliant EBITDA disclosures despite being directly informed by this blogger. The SEC told CKX Inc. that its non-compliant EBITDA must be computed by revising their "calculation of EBITDA such that it is computed as net income (loss) (rather than income or loss from continuing operations) before interest expense, income tax expense (benefit), depreciation and amortization." Any other calculation cannot be called EBITDA. However, Overstock.com, just like CKX Inc., improperly reconciled its non-compliant EBITDA to operating income or loss rather than net income or loss and the SEC has utterly failed to take action against Overstock.com to correct its non-compliant EBITDA disclosures despite being notified by this blogger. Therefore, CKX renamed its non-compliant EBITDA disclosure as OIBDA or operating income or loss before depreciation and amortization and the company was able to remove losses from discontinued operations from its non-GAAP financial measure. What is the appropriate term for Overstock.com’s non-compliant EBITDA financial measure? Overstock.com, like CKX, improperly used operating income or loss as the starting point to compute its non-compliant EBITDA calculation. In addition, Overstock.com, like CGG Veritas, improperly removed stock-based compensation expenses from its non-compliant EBITDA calculation. Perhaps Overstock.com's non-compliant EBITDA should be renamed OIBDAS or operating income or loss before depreciation, amortization, and stock-based compensation expense. Note: Overstock.com does not have income tax expenses due to its losses. However, this blogger has directly notified Overstock.com Audit Committee member Joseph J. Tabacco Jr. of the company's non-compliant EBITDA disclosures and the company has failed, just like the SEC, to address its EBITDA reporting errors. What’s going on at the SEC? I am beginning to believe that our present SEC is not of the same caliber that I feared as the criminal CFO of Crazy Eddie in the 1980s. They are overwhelmed and under-resourced. Instead, they using their highly taxed resources to chase delusional conspiracy theories such as those blaming short sellers on problems related to the subprime crises effecting Fannie Mae and Freddie Mac. I suggest that you read Joe Nocera's blog post entitled, "First, Let's Kill All Short-Sellers." Perhaps that explains why companies like Overstock.com can thumb their noses at SEC rules while the SEC drops investigations of such companies. The tragedy of American capitalism is that most investors rely on incompetent or at the very least lazy and spineless Wall Street analysts for research and inadequately trained but similarly spineless auditors to make sure financial reports are free of material errors. This tragedy is further compounded by an overwhelmed and under-resourced SEC chasing delusional conspiracy theories touted by company managements who are unwilling to take responsibility for their misdeeds. Disclosure: Not long or short Overstock.com, CGG Veritas, and CKX. Inc.